Place identity in Australia is currently in a state of flux, owing to the decentralization of cultural landscapes through urbanization. Indigenous caring for landscape has always been associated with the originary condition of Australian wilderness. 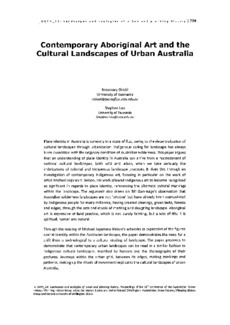 This paper argues that an understanding of place identity in Australia can arrive from a reassessment of national cultural landscapes, both wild and urban, when we take seriously the imbrications of colonial and Indigenous landscape practices. It does this through an investigation of contemporary Indigenous art, focusing in particular on the work of artist Michael Jagamara Nelson. His work allowed Indigenous art to become recognized as significant in regards to place identity, referencing the alternate cultural markings within the landscape. The argument also draws on Bill Gammage's observation that Australian wilderness landscapes are not 'pristine' but have already been manipulated by Indigenous people for many millennia, having created clearings, green belts, forests and edges, through the acts and rituals of marking and designing landscape. Aboriginal art is expressive of land practice, which is not purely farming, but a way of life: it is spiritual, human and natural. Through the reading of Michael Jagamara Nelson's artworks as expressive of the figures spatial identity within the Australian landscape, the paper demonstrates the need for a shift from a technological to a cultural reading of landscape. The paper proceeds to demonstrate that contemporary urban landscapes can be read in a similar fashion to Indigenous cultural landscapes. Inscribed by humans and the choreography of their gestures. Journeys within the urban grid, between its edges, making markings and patterns, making up the rituals of movement implicates the cultural landscapes of urban Australia.